It wasn’t the last time I was asked this question, but the more children I have accompanying me, the less I hear it! I don’t know if it’s a given that I’m busy or if they’re scared to ask? Am I just a mom? Many women have bought the idea that unless they’re using their gifts, talents, and abilities, independently of their homes and families, they’re wasting away their lives. Friends say they would love to be full-time homemakers, but they feel guilty because they think they’re squandering their education and skills. My original plan was to complete college and after spending a few years pursuing my career, start a family. But due to a few factors, we tweaked the plan a little: I decided that after having our perfect-sized family of three children, I’d attend grad school once my youngest was old enough to attend preschool and then finally start my career! But I didn’t count on having a change-of-heart towards children, towards my home and family, towards homeschooling, etc. 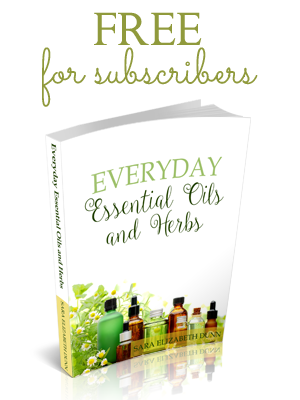 While I have invested time studying natural health, nutrition, and herbal medicine, these are all things which support my goal to minister to my family. Am I wasting my skills? As a good friend would say, “Are you kidding me?” I can’t even begin to tell you the number of hours upon hours, likely months upon months, of reading, researching, interviewing, questioning, and investigating I’ve done as I’ve advocated for the health and care of my children, especially my son who is on the Autism Spectrum. I manage this home, plan menus, handle the finances, and meet the needs of seven people, while also assisting my husband with his company, by managing his Accounts Payable and Human Resources Dept. I’ve also assisted my husband in various forms of ministry over the years. I’ve taught three children how to read (even one who is diagnosed with Dysgraphia and Dyslexia), and I have hand-picked curriculum for each individual child. I love and encourage my husband and children, guide them, run errands for the whole family, implement all I can to keep them healthy, and nurse them back to health, when they fall ill. I have learned to thrive on less sleep because “Mama Radar” never turns off, as it continuously monitors the well-being of the little ones under my care. As for my natural abilities and skills, I believe I’m equipped so that I can be the wife and Mama my husband and children need so they can flourish! Each of my children have a purpose–it’s no accident that God placed them in our family. I no longer think that my obsessive need to research is so I can work for the FBI (inside joke), but because that trait is something my children needed in a mother who would advocate for them, something my husband needs in a wife so that he can successfully run a company and minister to others. Everything about me was created for my current “career”: helping my family reach its potential. I know that the above goes against mainstream thought. There was a time when I would’ve written a comment begging the writer not to lose herself in her family and children. And I would’ve believed I was doing her a favor. But here’s the thing: I haven’t lost myself! I haven’t lost anything! I’m living out exactly who I am! No masks here! When folks asked, “Don’t you ever get “me time,” I finally realized that this IS “me time”! I’m not saying I don’t appreciate an afternoon out with friends or even some time alone, but these years are passing quicker than I imagined, and I don’t want to look back and realize I missed precious moments and teachable opportunities. There will come a season when my responsibilities will change, as will the needs of my family. For those of you struggling and wondering if you’re wasting your time, talents, and abilities by being a full-time mom and homemaker, I want to encourage you to know that you are not mindless! You are not wasting your days. You ARE a woman with a high calling! « Midwife? Family Doctor? OB/GYN? Great post! Thanks for sharing. I only wish more people understood this…but then again, I had to come to this understanding, too. This is our God given calling, my friends! Thanks for sharing your heart today. Thank you for posting this, I really needed these words today! Thanks for this post and I hope we can reach more young people before they have to learn the hard way. Thank You, it so good to be reminded of the incredible value of a SAHM. Society tends to forget and it is easy to get discouraged. Last year my husband and I were applying for life insurance and our agent called me a few days after our meeting and asked(He seemed very embarassed to ask BTW) if there was anything additional that I did, because the company needed some justification for the amount of life insurance on me. I was completely shocked. Apparently they didn’t see the value that my family sees. welchesfamily, congratulations on your new baby! I’m happy to hear you’re settling in well being at home. And you’re right! I look back and think we would’ve bypassed some heartache, if I’d understood then, the value of what I’m doing now. Well written, and very encouraging. We are swimming against the tide of culture and find others going in the same direction is a breath of fresh air when the current gets strong. If you were merely justifying an easygoing existence while your husband slaved away, then I would have expected some ranting. Instead I find words spoken from the heart of one who knows the struggles and joys of a dying entity–the keeper at home. Thank you for sharing this. It’s so easy to get discouraged and be affected by the mainstream culture’s notion that what we do as SAHMs isn’t of great value. Even if I don’t particularly NEED that “me” time that they always talk about, because everyone’s always talking about it, I find that I get grumpy, saying, “I don’t ever get me time!” when I didn’t even really want it in the first place! I find that it’s not even always from people who don’t value motherhood. There’s this trend now where SAHMs laud themselves and their role, saying things like, “It’s the most important job in the world!” and thus, as people who do that job, we somehow deserve special treatment. 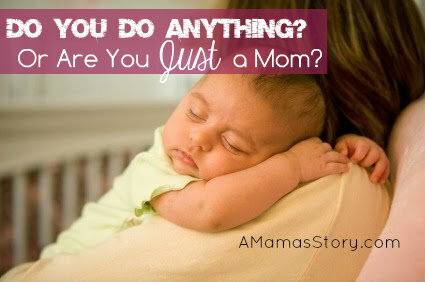 This is not “the most important job in the world.” It’s motherhood. It’s what we are. Once we stop comparing ourselves to other people, we’ll stop acting like we are owed “time off” and “vacation,” as though it’s comparable to a profession. I love this post, Sara Elizabeth! Thanks for sharing your heart! Thank you and praise God! I needed to hear this. I am constantly feeling this way. I’m a grandma now, but I can’t tell you how often I had people say similar things to me through the years when I was keeping our home and home schooling and involving myself in serving others from my home. I love how you worded it “me time”. I totally agree. Thanks so much for this! I really needed to hear it. Every day it seems I’m thinking at the end of the night, “I didn’t get anything done today! !” But really, I got the important thing done of being with and caring for my daughter, and the rest can wait! Stopping by from the WLWW link up! As a mom who went back to the office when my baby was 3 months old, I fully support your choice. Caring for other people without pay is a noble and loving thing to do! I enjoy being an employed mom, but it’s easy to see it’s not the right lifestyle for everybody. I’d like to suggest that when someone asks, “And what do you do?” you say something like, “I am a home-school teacher, Accounts Payable manager, and autism caregiver.” After all, this work that you do would have those titles if you were doing it for someone outside your family–so get the credit you deserve! That’s when you’re talking to someone polite enough to have asked an open-ended question–I have no idea how to respond politely to someone as rude as that doctor! Just letting you know that this post was among the top 3 most viewed linkups from last week’s linky party! I will be featuring you this Thursday! Come grab your featured button! Oh, WOW! Sara Elizabeth, this is just so important!! I would like to feature this post tomorrow on the ‘EOA’ link-up. Excellent! Great post! Could not agree more!!! Glad I found your blog! Thanks! And welcome, farmlife chick! I don’t regret it one single bit. It was a blessing. Such an encouraging post! I have talked to so many mommies who say that they go to work to get a break! Even though we have our moments, I can honestly say that there is absolutely nothing else I would rather be doing than staying at home with my 3 children. My husband is so supportive and works very hard to provide for us. We just decided to homeschool – something I never thought I would do – but I love it. I’m glad I don’t have to miss a moment. These years go by so fast! So true! It is a lot of work to be “just a mom.” It is a great practice to list out all the responsibilities you actually take care of, and see how much you really are doing. I got my Bachelor’s degree before I became a mom, and I never even really considered being a stay-at-home mom. I just figured I’d work, like my mom did. Luckily, my husband wanted a stay-at-home mom for our children. I was so glad to quit the job I hated and stay in the home! I am grateful for people like you who spread the truth about the jobs we do in the home, and to take the risk of not making that extra income we could be making outside the home.